MEXICAN FOLK ART, VINTAGE & NEW Bringing the Colors of Mexico Home to you. "Arte de la Vida and Galería Senita are proud to present the Encaustic Assemblage Artwork of Kim Crooks and the Assemblage Artwork of Kyle Johnston. ​Show Opens March 2nd and continues thru April 27th. Please join us for a Artist Reception (Light Refreshments will be served) March 2nd, 6:00-8:00 PM." Arte de la Vida was founded in Tucson, Arizona by two gents, Kevin and James, with much help from our beloved four legged folk art friend's Jack and Artie! The Arte de la Vida 'collecting' bug started about 15 years ago and has been nurtured over many years of driving across the Southwestern states 'hunting' for goods to add to our collection. We finally got the 'selling' bug and happily decided to open our first store in 2012. 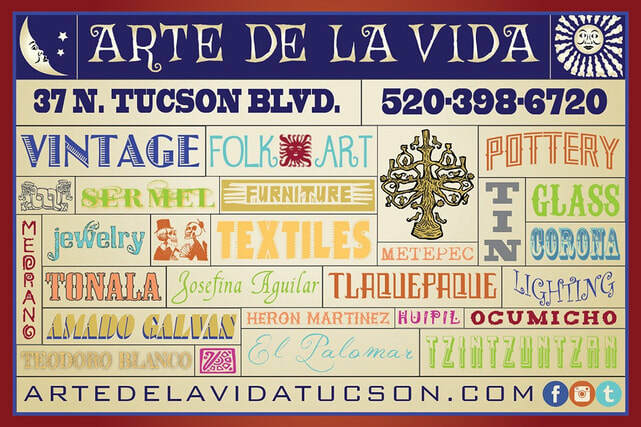 Along with the brick and mortar, we present this website, offering a selection of our wares so that the rest of you who do not reside in Tucson can share in the passion known as Arte de la Vida. ~ Vintage pieces from Mexican Maestros such as: Heron Martinez, Candelario Medrano, Teadora Blanco, Alfonso Castillo, Lucano, Olay, Dolores Pores and the Josefina Aguilar, to name a few. ~ A growing Collection Of Vintage Arizona Fine Crafts, Mid Century Modern and Mexican Modernism. ~ Contemporary pieces from artists like Angel Ortiz, Alfonso Soteno and Sergio Gonzalez, and many others. Our wares for sale include Mexican Pottery, Folk Art, Tin, Wood, Textiles and the largest collection of Vintage Mexican glass in the Southwest. Set in A Tourist Shop Atmosphere when the days of crossing the border where safe and fancy free, Arte de la Vida strives at capturing the Mexico of your youth! Arte de la Vida is always searching for quality items from single pieces to entire collections. This means we are always on the “hunt” to find new items so you can add unique pieces to your treasured collections. Just let us know what you are looking for, and we will keep our eyes open. To be of further assistance to our collector friends, we are happy to do consignments.